Damnably caught up with Duglas from the BMX Bandits who play with very old friends Shonen Knife on October 5th at Oran Mor, in Glasgow for the first time in 20 years. Not many bands last 20 years but both Shonen Knife are 30 years old now and BMX Bandits are 26 years old, why do you think you lasted so long? D. I think we’ve both last so long because we are doing it for the love of music and entertaining people. I think for both the groups this ethos comes before a career plan. We believe in what we’re doing and so we’ll keep on doing it. N. I’m just spending my daily life as Shonen Knife and without notice, so many years have passed. I get energy from audience when they looked happy to listen to our music. Shonen Knife fans and people who support us, like management and record label, made me lasting the band. think you songwriting changed over the years? D. I think both groups have kept the same spirit. We might be musically more sophisticated and capable but we’ve kept a pure and uncynical heart in what we’re doing. I think it’s the same with my songwriting. I am able to be more musically sophisticated but I think I’ve still got a naivety and joyful exuberance in how I approach it. Even in my saddest songs there is hope. N. My rock spirit never changed but if my song writing got improved, I’m happy. Early albums were very primitive. Recent albums were more progressed. The new members, Ritsuko and Emi are good players. The latest album “Pop Tune” became more powerful pop rock album. Have you seen changes in the music industry in that time and in Glasgow? D. Well at that time lots of people still bought music and it made it easier to survive as a musician and to finance tours. Now a lot of people won’t pay for music. There is a culture of entitlement out there that makes it hard for artists. Also in the early ’90s alternative really meant alternative as far as music went now the most conservative and square individuals and groups have adopted the alternative label, bought what they perceive to be the correct alternative uniform and so it’s harder to spot the enemy. We were outsiders back then who were their for fellow outsiders and misfits and we’re still proud to be outsiders today. What favourite songs do you have of each others bands? D.It might seem like an unusual choice but I really love Space Christmas. N. It’s difficult to choose one because all of their tunes are GREAT. If I choose one, Getting’ Dirty. I’m sure that when we toured together, they played songs from Getting’ Dirty album. This song is a memorable one. Johnny has Naoko, Ritsuko and Emi join in on songs-will the BMX Bandits and Shonen Knife team up on any? D. I don’t know yet but I think it could be fun if it happens. N. (after the show) It was great that we could play “Top of the world” song together in Glasgow. What new Scottish bands do you like ? D. Randolph’s Leap, TeenCanteen, Snowgoose, Dumb Instrument, Lenzie Moss and The Wellgreen are some that Id really recommend. Plus there is a songwriter called Adam Stearns that I really think is special, he’s been touring with Euros Childs and The Wellgreen recently. N. Of course BMX bandits and I like Teenage Fan Club, Eugene Kelley’s bands, Eugenius and Vasellines, too. What food in Japan do you most enjoy Duglas and which other acts do you enjoy from there? D. My very favourite was a purple sweet potato flavoured ice cream that I understand is seasonal and that you can only get in Autumn. Nika (Nikaido Kazumi), Cornelius, miette-one and many others too. I also listen to some older japanese acts like Happy End and Plastics. I am very pleased that miette-one will be playing keyboards with us at the Glasgow show. Last question for Naoko-how you remember the tour with the BMX bandits? N. We shared a 11 seats van. BMX bandits seated at front and Shonen Knife were at the back. Everyone drunk alcohol after show most of everyday. I couldn’t drink so much and I drunk tomato juice very often. This experience became the root of my song “Tomato Head”. Douglas has never changed since we toured. He never get aged. Always the same. That’s great. 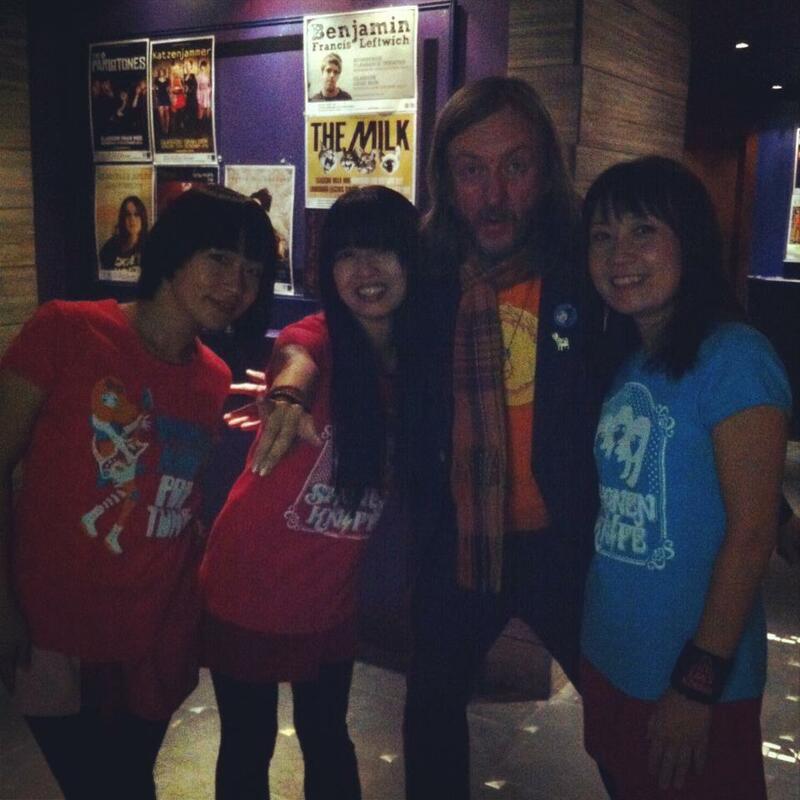 Damnably would like to thank Shonen Knife and the BMX Bandits for such a magical reunion gig at Oran Mor in Glasgow. It was one of those dream concerts in such a beautiful and amazing sounding venues with a very happy audience.